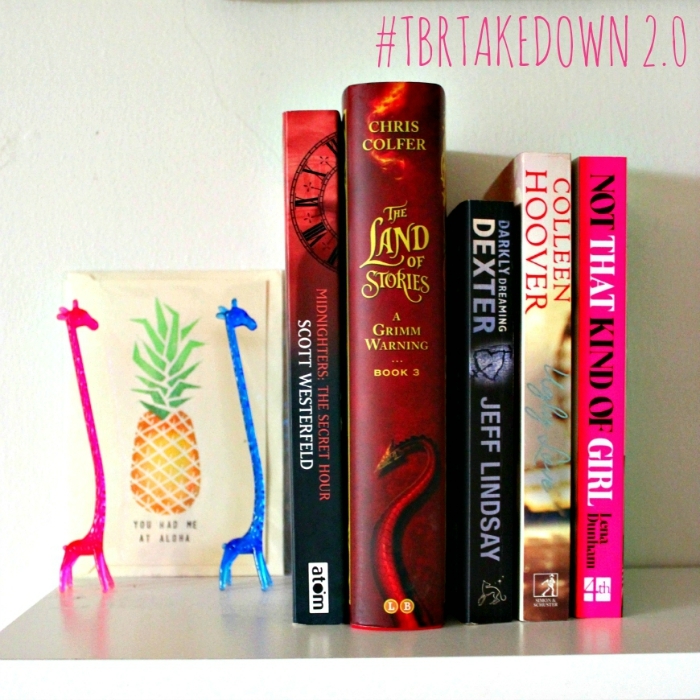 If you read last Saturday's post then you'll know that this week I've been taking part in the TBR Takedown 2.0 readathon. I was originally going to post a mid-week update, but it kind of got to mid-week and I hadn't really read as much as I expected so...yeah that didn't happen. I thought it'd be a nice idea to wrap up the readathon separately from my monthly wrap up (that will be going up on Monday!) so that I can break it down and see how I did over the week. I started my first book which was The Secret Hour by Scott Westerfeld, this fit into the challenge 'the first book in a series'. I was pretty pleased that I managed to get 200 pages in seeing as I'd already read about 50 pages to finish off my previous read earlier that day. I think I already knew at this point that I wasn't going to get all the books read but I didn't mind. I managed to finish off The Secret Hour pretty quickly and moved on to The Land of Stories: A Grimm Warning by Chris Colfer. This fulfilled the challenge of 'an unread sequel'. I was super excited to get back into this world and thought I'd get through it pretty quickly. However as always, I underestimated my exhaustion and my relative busy-ness for the next couple days. I carried on with A Grimm Warning and managed to get a good chunk read, although I had hoped to be finishing it up I didn't really mind as I was reading at my own pace and enjoying the book. Although I did have to keep reminding myself to relax and that it didn't matter if I didn't get all five books read. I didn't read very much this day, I was feeling quite unwell and resting in the day and then spent the whole evening with a friend and didn't read before bed like I usually do. This day actually felt like a nice rest from pushing myself to read and I was reminded of the importance of taking a break to socialise as it definitely lifted my mood. This was the day that I read the most and I honestly think it was because I'd taken a bit of a break the day before. I spent quite a lot of the day reading and found that I couldn't put down A Grimm Warning and finished it up in one sitting. I then had a bit of a break but was really in the mood for reading so picked up my third book Darkly Dreaming Dexter by Jeff Lindsay. This was my pick for the 'book that's been on your shelf for over a year/the longest challenge'. I kind of thought if I don't read it now I never will as I didn't have a huge desire to read it. It was a pretty easy read and I got through half of it before heading to bed. Today I finished off Darkly Dreaming Dexter fairly quickly because as I said it's an easy read and pretty fast-paced. I'll probably read some more tonight and if so I'll be picking up the fourth book Ugly Love by Colleen Hoover. But as it's unlikely that I'll finish it I won't be counting it as part of the readathon. Overall I'm actually pretty pleased with how I did, I think I kind of knew that I wouldn't be completing all the challenges but I'm definitely happy with the amount I read. I did enjoy joining in with some of the sprints on Twitter and interacting with other readers and seeing how everyone else was doing. I think I'll definitely be taking part in more readathons in the future as I enjoy the challenge and think it's a really great way to get to books you might not have otherwise picked up. Did you take part in the readathon? How did you do?